Get Rad on the street or in the dirt. The Kenda K-Rad is equally at home in the city or on the hard-packed trails thanks to an quick rolling yet grippy inverted tread. This version of the K-Rad is available in 26 x 1.95 Inch (50-559 ISO). 65 max PSI. 60TPI. Wire bead. Claimed weight: 630g. Remarkably good tire - excellent rolling resistance, ultra quiet tread pattern, very good looking, very light weight for the size. I use on a Vision MWB recumbent, front 20x1.95, rear 26x1.95, runs all day at 70psi, yet high volume provides plush ride, rolling resistance compares favorably to mtn slicks (I have used Contisport Contacts, Michelin Runr, and Primo Comets) - yet these provide flexibility to hit fire roads, light trail riding, and mild off road without worry. And they are very inexpensive, plus they come in 20406 and 26559, perfect for a good looking, multi purpose yet speedy recumbent. Highly recommended. Good enough roadcommuter tire, but not great traction in the wet. Wire bead. Inexpensive wire bead tire, suitable for cruiser or light commuting. I have mounted it as a rear tire and find that it's grip on road surfaces isn't ideal when braking, especially in the wet. That said, I maybe push these tires a little more than they were intended for. If you're looking for an inexpensive tire for light duty road use, these will serve you well. i run the k-rad 2.3 on my hardtail and have ridden (iirc) 4 pairs over 11,000 miles (mostly paved path, but a lot of cinder as well). they rarely flat, wear well, and can be mounted-dismounted without tire levers. solid handling in dry-wet. look cool, too. Smooth commuter tire with reasonable traction. The tires were affordable and provided me with a smooth ride on my mountain bike commuter. They wore out a little faster than anticipated, but I weigh 220 and tend to do rear brake skids quite a bit. Holds up very well for my riding, yes I use it on trails as well. These tires are perfect for what they are - an inexpensive hybrid tire that does a lot of things very well. Put this tire on a free carbon fiber cyclocross frame (damaged in transit) that I built up with some mountain bike components I had around. I use the bike for light trail around town riding and really like their feel on gravel/dirt as well as their ability to run on asphalt with relatively low rolling resistance. These would make excellent commuter tires - I have put a few hundred miles on them and see very little wear. Perfect tire for the urban environment. This was the tire I've searched for. Much better on my Mountain bike than narrower cross tires. This is a nice tire that has the profile of a trail tire but does great on pavement and dry dirt trails. If you are looking for a tire that will spend most of it's life on pavement and dirt trails this is the one. With grip up the sidewalls it can do almost all. Obviously not good for mud. Smooth rolling tires that is sure-footed everywhere, including pot holes, cracks, and sidewalks. Even on downhills, the treads grip very well around concrete and asphalt. I ride about 75 miles every week for commuting. These tires roll very straight and no wobble - unlike the stock tires I got when I bought by GT Aggressor 3.0. I was looking for an affordable and durable tire that is appropriate for varying terrain. The Kenda K905 fit my needs for the many rail trails in the area that frequently change from packed cinder/gravel to pavement. I've used Kenda K-Rads on 3 bikes now and I keep coming back to them. They're pretty good on dirt, pavement, and crushed aggregate, taking into account changing tire pressure. They tend to wear fairly quickly, however, and these 1.95 are rated only to 65 PSI. Got these to replace my worn out Kenda Kwicks. Mostly commuting and some trail riding. These don't roll as fast as the Kwicks but do feel more heavy-duty. They seem most at home on dry dirt and feel like they would be good for dirt jumping and maybe racing on hardpack. They feel like a BMX tire on my mountain bike. They don't clean mud very well. Found that out pretty quick on a trail that was pretty sticky. Got totally plugged up and had to leave the trail. On a drier trail they were ok but didn't grab on climbs where there were leaves. That would be expected just by looking at the tires though. Overall they're ok, but haven't blown my mind or anything. They seem pretty tough which is good. Very good price on this tire, couldn't resist. Easy to install, well made and looks good too. Have only riden on the road in dry weather and it road nice and smooth, not road tire smooth but very good. Low rolling resistance but still had good side grip when cornering at moderate speeds. I ordered these bad boys and they arrived early (sa plus), and immediately put them on a Klunker that I'm building. I really dig these tires, and will be ordering more, as i have three more Klunkers to build. Awesome tracker all around tire! Cant be beat for the price and traction it offers. Just put these on my bike and they performed well on on the road and on the trail. Grip was fine on the trail and some loose dirt and they have comfortable ride. Fantastic Tire for the Price. I was really surprised at how well these tires perform. We do a lot of combination riding.....asphalt -gravel roads - hard packed trails. My previous tires were off road mountain bike tires that had a lot of rolling resistance when on hard pack or asphalt. These don't require nearly the energy on the hard pack and still handle well on gravel. Super tires, ride really smooth, great on gravel, and dirt, I made the right choice. This is a great tire rolls easy on asphalt and sticks good on packed nountain bikr trails. Very fast on mountain trails,easy climbing. 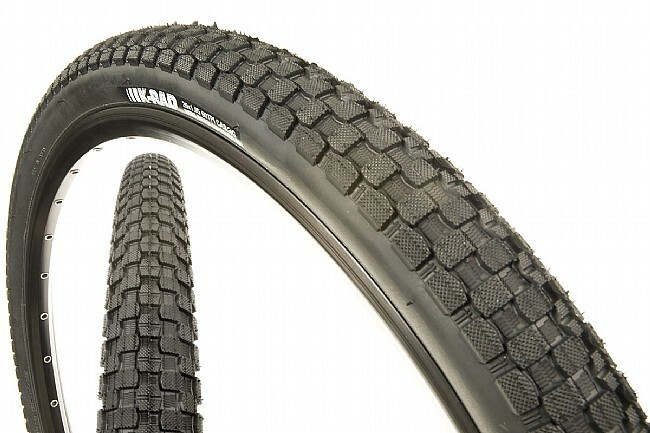 This is a fast rolling tire that does a serviceable job on gravel and hardpack trails. Does not do well with mud at all, but its not supposed to. I have these tires on an old mountain bike I converted to a fixed gear for commuting use. They roll almost as fast as the tires on my cyclocross bike, but I don't have to worry nearly as much about punctures.